Solid wood floors are a popular home flooring choice because they have an elegant, natural appearance, are easy to maintain, add value to your home, and are energy efficient. There are many different species of wood floors to choose from, including hickory hardwood floors. This less common type of flooring has many benefits that make it perfect for almost any room in your home. Here are five reasons why you should consider having a hardwood floor installation company add hickory floors to your home. With a Jenka ranking of 1820, hickory is one of the hardest, most durable wood flooring types on the market. If your home sees a lot of foot traffic or needs to withstand a large amount of wear and tear, choose hickory floors since they are resistant to dents and scratches. Hickory is known for having a unique, complex graining design that displays a wide variety of colors. This wood type if perfect if you want to give the room a rustic feel. Although oak, the most common type of wood flooring found in homes, is a cheaper option, hickory is moderately priced when compared to other wood types. However, hickory will need to be installed by a hardwood floor installation company which will need to be factored into the overall price. Like most other solid wood floors, hickory flooring is extremely easy to maintain. As long as you regularly clean your floors with sweeping and mopping, you can easily preserve its sleek appearance. 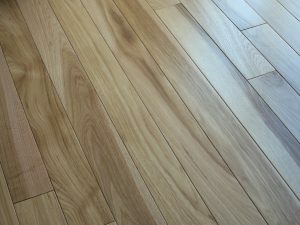 If you’re looking for an eco-friendly flooring option, hickory is a great choice since it is grown in the United States. You can ensure the wood you buy is sustainably sourced and manufactured by looking for an FSC certification. Compared to other common types of hardwood flooring, hickory floors are a great choice since they are especially durable and look extremely attractive. Contact a hardwood floor installation company to learn more!